It was in early 1965 that Edie met Andy Warhol, at Lester Persky’s apartment. A few weeks later Sedgwick and Wein began frequenting the Factory at the apex of the romantic and still-new Warhol image. Her first film with Warhol was “Horse,” a quick cameo of sorts of her entering the Factory doors at the end. After that was “Vinyl,” an otherwise all-male imagining of “A Clockwork Orange” that Warhol stuck Edie into at the last minute (much to Gerard Malanga’s annoyance). In March they filmed “Poor Little Rich Girl,” a film that would become synonymous with Sedgwick’s persona. 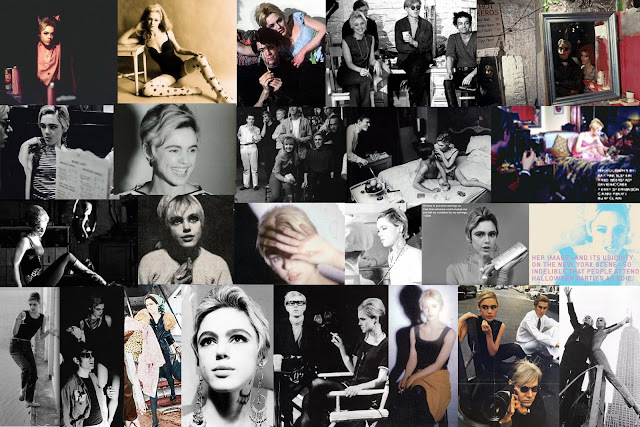 Part of the ‘saga’ including “Restaurant,” “Face,” and “Afternoon,” “Poor Little Rich Girl” featured Edie in her apartment as she’s waking up, applying her makeup, listening to albums, trying on clothes, making plans for the evening, smoking cigarettes, and talking about how she spent her entire inheritance in six months. In April, 1965, Edie (now “the queen of the Factory”) accompanied Warhol (and Gerard Malanga and Chuck Wein) to Paris for an exhibit of Warhol’s work. Following their return, Warhol requested from Factory screenwriter Ron Tavel a script for Edie, “something in a kitchen. White and clean and plastic.” Warhol got exactly what he asked for, “Kitchen” starring Edie with Rene Ricard and Roger Trudeau was the result. After “Kitchen,” Chuck Wein replaced Tavel as writer/assistant director for “Beauty No. 2,” a film with Gino Piserchio that some consider to be her finest work with Warhol. The film, featuring Sedgwick kissing Piserchio only to keep being interrupted by an ominous voice’s aggressive and prying string of questions (courtesy of Chuck Wein), earned the underground star comparisons to Marilyn Monroe. By now, Warhol had long dubbed her his ‘superstar’ and the pair were often seen together around New York, at both classy socialite events and dingy downtown clubs. With Edie on his arm, Warhol was introduced to a new level of publicity and fame, eventually being welcomed into the wealthy world of upper New York. Sedgwick was now one of the most popular girls in New York, embodying the edgy “now” image associated with Warhol, but also combined with her refined, upper-class upbringing. Her appearances in Warhol’s films were earning her a following; her trademark shoulder-duster earrings, cropped platinum hair (done to resemble Warhol), and wardrobe of black tights, leotards, and mini dresses (worn to ‘defy’ her upbringing and her parents) were becoming quite fashionable among girls who were both lanky like Edie, and some that weren’t really but just liked to pretend they were. She appeared in the August 1965 issue of Vogue, where Editor Diane Vreeland dubbed her a ‘youthquaker,’ and in the September issue of Life magazine in a fashion spread. Warhol had requested for Lou Reed of the Factory band The Velvet Underground to write a song about Edie, saying ‘oh, don’t you think Edie’s a femme fatale, Lou?’ The result was the Nico-sung ballad “Femme Fatale.” Throughout the rest of 1965, Edie continued to make films with Warhol, including “Prison,” “Outer and Inner Space,” “Chelsea Girls,” and her last official film for Warhol, “Lupe.” But by late 1965, Sedgwick and Warhol’s relationship had grown distant, namely because of Edie’s growing connection with the Dylan camp and her dissatisfaction over Warhol not paying or rewarding her in any way for her work. While out, Edie had always customarily picked up the tab; after months of paying for the Factory gang without seeing any profit from the films she made and the celebrity she experienced, she felt taken advantage of, not believing when Andy would say that his films weren’t commercial and made no money. She requested that Warhol not show any of her films again and for the footage of her in “Chelsea Girls” to be edited out (it would be replaced with a trippy lights sequence of Nico with Velvet Underground music playing in the background).